Many years ago I was playing in a collegiate soccer tournament in Pheonix, Arizona, USA. After being knocked out of the tournament, a teammate and I decided to drive to the Grand Canyon. High up in the Arizona mountains, we made a pit stop at a local lone McDonald’s. The prices on the Big Macs were three times as high as normal. I wondered why, and asked the staff. It was the high cost of getting water to the restaurant that drove the prices sky high. 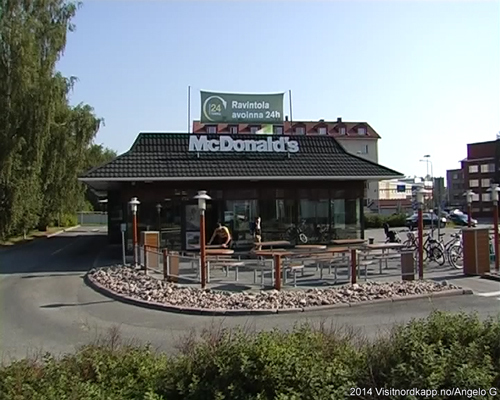 In Rovaniemi, you find the only McDonald’s so close to the Arctic Circle to my knowledge. (There has been one in Murmansk as well). I like to go there. It is clean, you know what you get, it is fast, and it is a good deal. 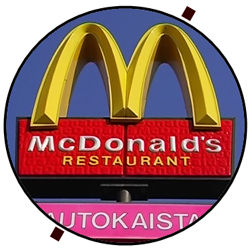 I haven’t been to any other McDonald’s in Finland. 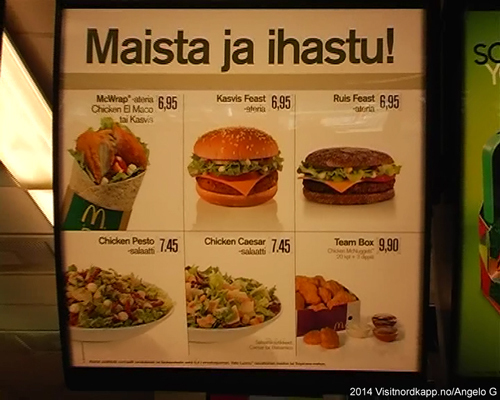 So, I wondered what the prices are in Rovaniemi, compared to other McDonald’s franchises in the south. Angelo got his film camera ready. The manager Mr. Pyry Liedes was busy talking with, it seemed, some McDonald’s auditors. The auditors soon left the scene, and before the manager could do any shooting, he had to help a customer. McDonald’s in the center of Rovaniemi is a buzzing place, indeed. 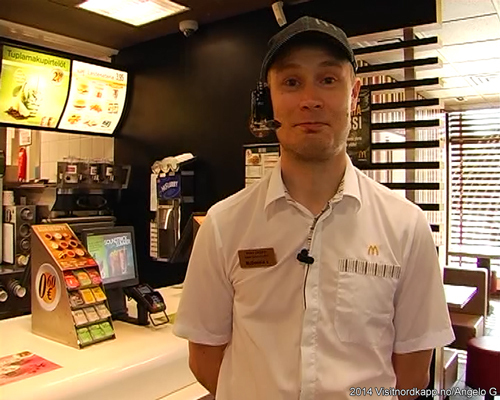 Pyry put on the mike and served us a few lines from the northernmost golden arches of Finland. They are open 24 hours a day and, as we could verify, it is a busy place. He estimates that half the customers are tourists. On the menu, McDonald’s have a special burger. A burger, were the bun is the national bread of Finland: A healthy, dark, dry and rye bread. The Ruis Feast is popular in Finland. McDonald’s standard menu makes a pass for the obvious profitable local burger. And, I almost forgot. McDonald’s prices in Rovaniemi are no different than elsewhere in the land of the thousand lakes.